Title:"There's a Hippopotamus on Our Roof Eating Cake"
Film Adaptation: Pocket Bonfire: selected for 2012 Little Big Shots National Festival. 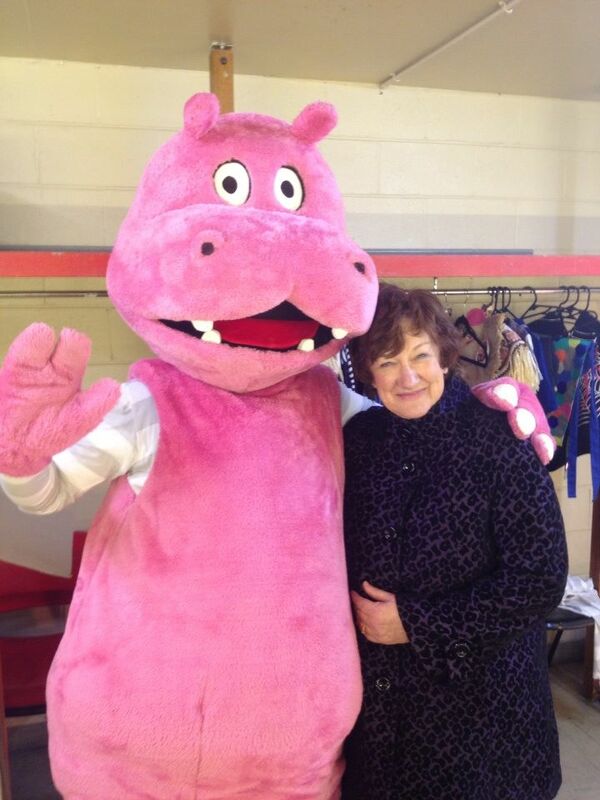 Hazel meets her own character, 38 years after creating Hippo. Deborah Nilandhas hippo merchandise like a library bag. Our roof leaks. Drip! Drip! Drip! My daddy says there's a hole in our roof. I know why there's a hole. There's a Hippopotamus on Our Roof Eating Cake. This is the story about a very big imaginary friend who can do anything! A colourful and reassuring picture book ideal for preschoolers. 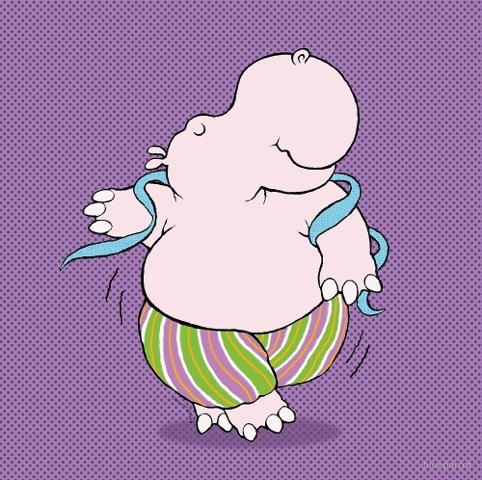 The Hippopotamus on the Roof Eating Cake celebrates its 36th birthday in 2016! 'Not Just a Piece of Cake; Being an Author' Hazel's memoir, includes Q& A and 100 Hippo History anecdotes. There's a Hippopotamus on Our Roof Eating Cake was adapted by Pocket Bonfire Productions as a short film. Starring Angus Sampson and Bridie Carter, the story follows rogue 9-year-old Zoe and a shower-singing, bike-riding, cake-eating Hippopotamus. A range of resources are available for download below. Enjoy! 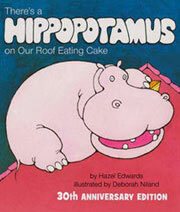 Have you read There's a Hippopotamus on Our Roof Eating Cake? Why not send Hazel a comment? You can email Hazel, tweet Hazelor post a message on her Facebook Page.You could also write your own book review. Here are some of the comments online.